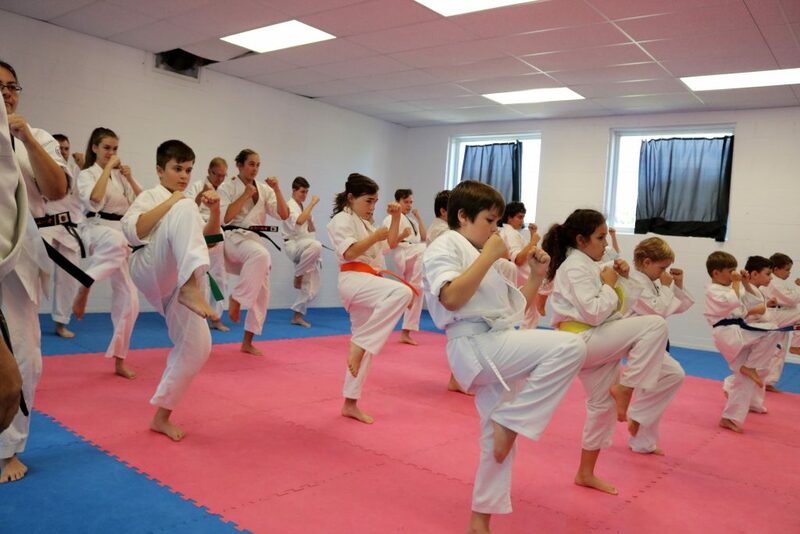 At Kanreikai Joliette, we promote the practice of karate for all since 1997. Children, Teenagers and adults benefit from this traditional martial art under the lead of experienced certified instructors. We invite you, whatever your age and your physical fitness,to join us and discover all that Kanreikai Karate has to offer. Your kids and teenagers will improve their physical fitness, concentration and self-confidence and they will make new friends. You will even be able to train with your kids and enjoy precious family time! Our young children (aged 3 to 6 years old) discover karate through games. THey learn basic kicks and punches and even do light sparring with the instructors. From the start, your child will learn the dojo’s rules of conduct as well as the ways to do typical of traditional Japanese Karate. Soon, she’ll be counting… in Japanese! Our kids (aged 7 and up) live unique experiences at Kanreikai Joliette. They soon realize that it is with hard work and group support that they reach their objectives. The path of a young karateka is filled with challenges that your child will take on with pride. He will grow in self-discipline and self-confidence. Teenagers appreciate improving their fitness while learning a martial art. Boys and girls especially appreciate our fighting classes. Adults, whether they train with their kids or not, enjoy the friendly and safe atmosphere of the dojo. Each one progresses at his1her individual pace but all appreciate the steady support of the group! Competition is an integral part of our Kanreikai Karate program and we encourage all our students to experiment competition, if only once. We have specific trainings for the members of our competition team. Most karate tournaments present Kata and Fighting events. Even though competition events are individual, each competitor can feel the support of the whole team! YOU ARE PART OF THE WORLD KANREIKAI KARATE FAMILY! At Kanreikai Joliette, you will discover the world of traditional Japanese karate. Sensei Dominic Morin, 4th dan, has trained under the lead of Soshu Shigeru Oyama, founder of the World Oyama Karate Organization, and of Hanshi Manny Matias, grand maître de la World Kanreikai Karate Organization. Since 1997, Sensei Dominic teaches his art with a passion that he shares with his numerous students, kids, teens and adults. Kanreikai Karate offers to all the opportunity to improve in terms of physical fitness, flexibility, concentration, self-confidence and resilience. Even though the goals and paths in karate are individual, our students benefit from the support of their companions and from the friendly and safe atmosphere of the dojo. Contact us. Have a look at our Class Schedule and join us for a Free Trial Class!